Go for a swim or relax by the pool and enjoy spectacular views of Sedona desert. Gather the family around the fire pit and roast marshmallows. You’ll have plenty of space to chill out with the family and cook meals. 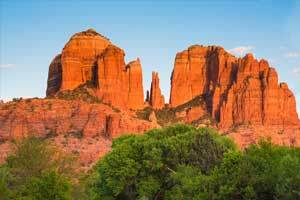 Book a tee time at Sedona Golf Resort, just 15 minutes from the resort. - The front desk is open daily from 7:00 AM - 11:00 PM. Guests that are planning to arrive after hours must contact the property ahead of time using information on the booking confirmation. Guests must use a phone located by the front desk to call a security guard who will check them in.